Exhibit Simplicity: Pop-Up and Go! Go "pro" with custom branded pop up tents by APG Exhibits. Commercial pop up tents are one of the most often used outdoor displays, and with good reason: they provide an attractive branding surface and also protect both staff members and event-goers from the sometimes harsh outdoor elements. APG provides hardware that is industry-leading in it's quality, as well as graphic print quality that cannot be beaten. We also have a bunch of options to make your logo branded pop up trade show tent stand out even more, such as a bow flag that attaches to the roof, as seen in this example. 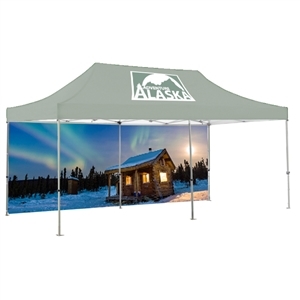 The combination of professional grade materials with the simplicity of set-up and the fantastic graphic options ensure a high return on investment and make these items a home-run for any outdoor event or trade show. Designed for indoor or outdoor use, our customized pop up tents deliver exceptional quality and the best value for your money. Printed using a one, two, three, four or full color process, our custom trade show tents are bright and eye catching, allowing you to stand out even in a crowded trade show or other busy event. Choose from a number of useful designs, and add options like a flag, banner or back wall. Whatever your specific needs are, our team can put together a package including all hardware and accessories necessary to set up your display tent the way you want it. Branded Tent Kits: Get a complete solution when you get a kit for your display tent. At APG, we offer packages that anticipate your needs, including display tent kits that feature feather flags, backdrops, collateral stands and more. 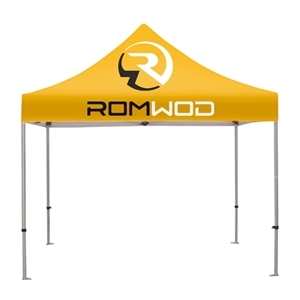 Each display tent kit includes a trademark quality, durable design and construction, as well as four-color processing that helps your brand message truly pop at crowded events. When you don't want to shop around for the many materials and accessories needed for a successful exhibit or event, turn to APG for branded pop up tent kits that make the most of your brand message. 10 x 10 Tents: When you want a versatile display tent that provides enough space for tables and team members, but one that also fits into tight spaces, add a 10 x 10 tent to your collection. At APG, we offer a series of 10 x 10 tents that feature optional side walls and backdrops. For a simpler look, get the tent alone, and enjoy the shade and shelter that a customized pop up tent provides at outdoor events. You'll be amazed at what an experienced and knowledgeable provider can do with your logo and branding on the relatively limited space available on a 10 x 10 tent. 10 x 20 branded Tents: For a large presence that provides plenty of table space to meet prospective customers, choose 10 x 20 tents from APG. These customized pop up tents let you share a large brand message atop the canopy, along its edges, as well as through an optional backdrop. You'll find that a 10 x 20 tent makes a perfect setup to capture attention at crowded outdoors events, driving the foot traffic that is necessary to achieving the return on investment you want. Inflatable branded Tents: For something different, consider inflatable display tents from APG. In crowded event environments, it can be hard to stand out from the crowd. Inflatable display tents help you present a unique look and brand message that will attract prospective customers and help you break out of the traditional mold. Shoppers can count on APG Exhibits for fair, upfront pricing that delivers the best value for their money. When you browse our selection of trade show tents below, each price you see will include the cost of printing from a pre-made template. You can also use our in-house design services, starting at $75 an hour, to create a custom graphic based on your specifications call today for a quote! We are proud to offer a low price guarantee on most of our commercial pop up tents. If you find a similar item for less at one of our competitors, we'll gladly match their price. Got a big event coming up? Order your pop-up tent right away to be sure it arrives on time. We are able to offer some of the fastest turnaround times in the business often as little as seven days for some products, not including transport. Rush orders are also available. There's no better way to raise the profile of your business than with a high quality pop up tent from APG Exhibits. Built to withstand the rigors of the road, an investment in one of our products delivers quality that will last for years to come.